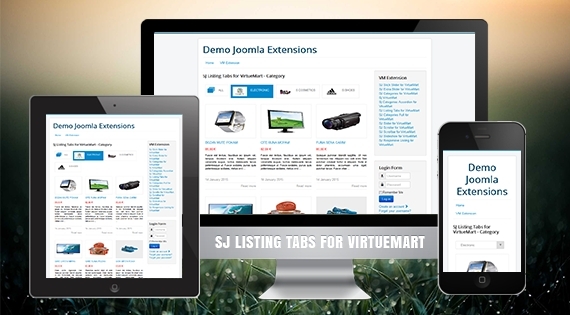 After the success of SJ Listing Tabs for Content, we would like to introduce SJ Listing Tabs for VirtueMart.This module is specified for VirtueMart component and compatible with Joomla 2.5 & 3.x. It will show products as tabs. In which you can choose whether to display products according to Category tabs or Field Product tabs. The friendly user interface of SJ Listing Tabs for VirtueMart allows you totally manage all parameters of the module. You can control where to get the product images. Besides, you can set what information of product will be displayed in the listing: Title, Description, Price, Add to Cart, Read More Link... With over 10 nice effects equipped, your product listing will appear professionally and impressively.